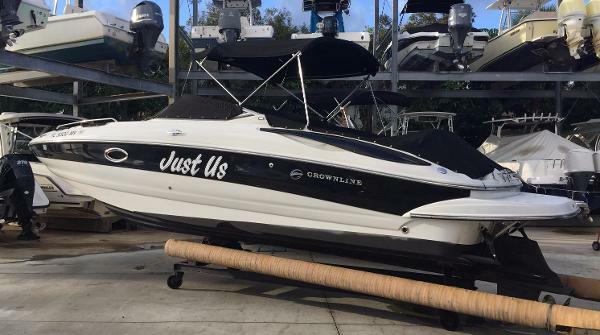 2004 Crownline 260 EX Rack Stored 191 HRS Garmin GPS Big sister of the 240, the 260 EX also comes with Crownline's exclusive, stabilizing Fast-Tab™ hull and boater-pleasing standards that make it so appealing. Generous storage compartments throughout, a wet bar in the lounge, bow and stern swim ladders, 48 quart carry-on cooler and a portable head compartment are just a few. The cockpit sunbed requires no filler cushions. Add Faria instruments, bow and cockpit fiberglass liner, flip-up adjustable Tri-Tech suspension driver bucket seat and all the other Crownline standards and EX also stands for exceptional value. 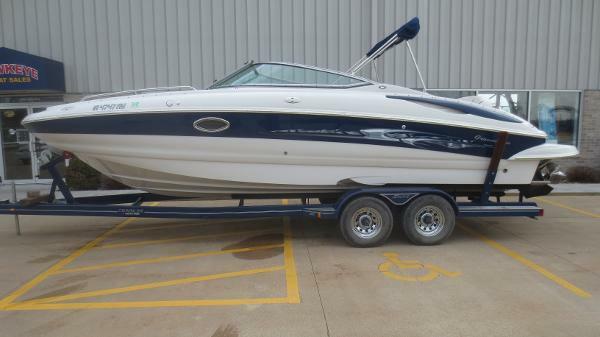 2004 Crownline 260 EX Check out this Huge party platform ! Big sister of the 240, the 260 EX also comes with Crownline's exclusive, stabilizing Fast-Tab hull and boater-pleasing standards that make it so appealing. Generous storage compartments throughout, a wet bar in the lounge, bow and stern swim ladders, area to stow a 48 quart carry-on cooler and a portable head compartment are just a few. The cockpit sunbed requires no filler cushions. Add lifetime warranted Faria instruments, bow and cockpit fiberglass liner, flip-up adjustable Tri-Tech suspension driver bucket seat and all the other Crownline standards and EX also stands for exceptional value. 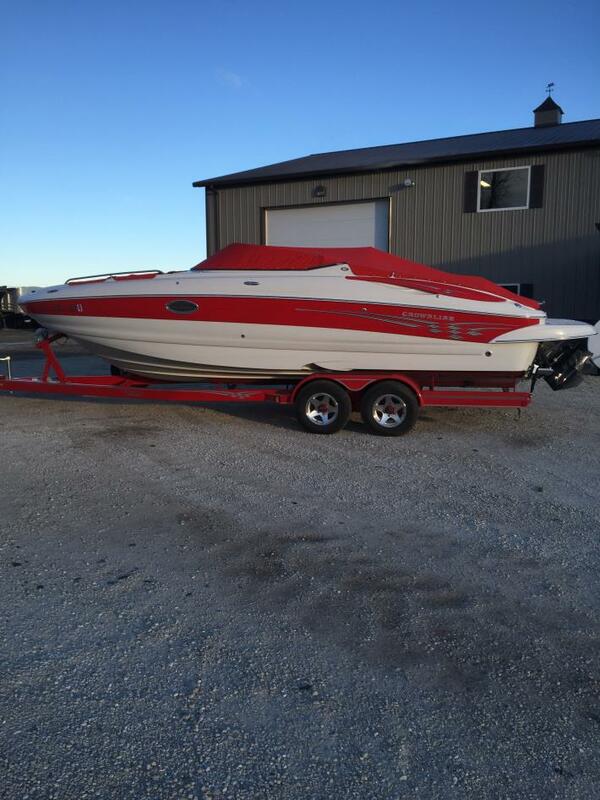 This rig has a powerful 496 MAG Mercruiser with the Dual prop out rive easily pulls wakeboarder or skiers or any inflatable tow sports. 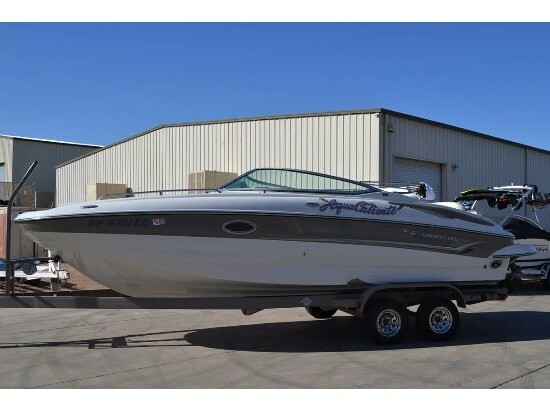 This 260deck boat comes with : 375hp Fuel injected big block 496 MAG Closed cooling system Custom Wakeboard tower with 8 speakers and tower racks Front and rear bimini tops Clarion sound with dual amps, and 12 speakers Pump out porta pottie and sink 4 battery sytem 600 watt power inverter Snap out carpet Cockpit bar/sink Forward boarding ladder Docking lights Bow shower Custom trailer and more Call us today! Financing available - WHOO HOO ! Check out this boat! 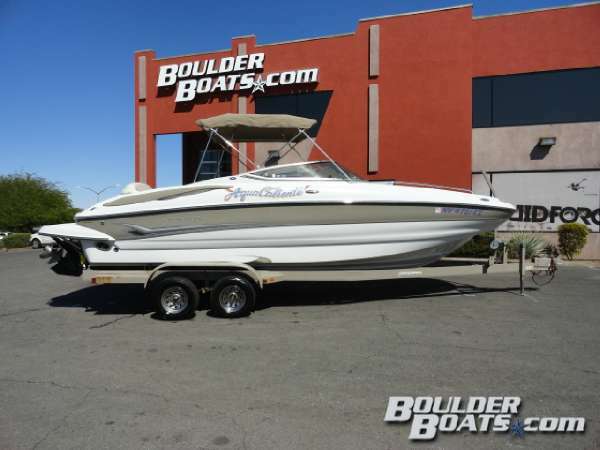 2005 Crownline 260EX This Is A 2005 Crownline 260 EX Deck Boat, Equipped With A Mercruiser 496 MAG Bravo-3, I/O 375Hp With Only 340Hrs. 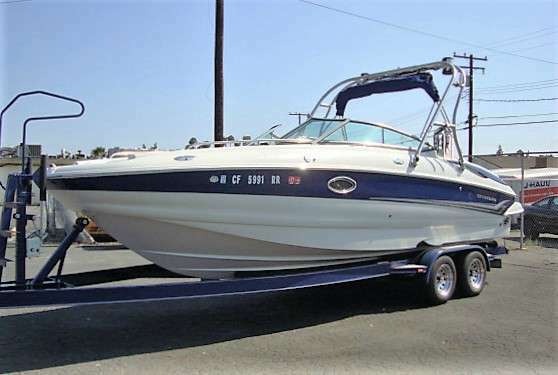 Includes Am/Fm CD Player, Depth Sounder, Fish Finder, Pressure Water System, Dual Batteries With Switch, Docking Lights, Fresh Water Cooling System, Trim Indicator, Fuel Injection, Bimini Top, Ski Tow Bar, 3-Blade SS Prop, Carpet Runners, Front And Rear Showers-Cold, Tilt Wheel, Area For Enclosed Head With Sink, Cockpit Sink, Pop-Up SS Cleats, And Large Swim Step. Seats 14, Driver Captain Seat, Passenger L-Shape REar Seating With Transom Entry, Wrap-Around Open Bow Seating. Trailer Is A 2005 Zieman, Painted Yellow, Tandem Axle With ALuminum Step Plates, Custom Wheels, Disc Brakes, Surge Brakes, And Spare Tire With Carrier. Trades Welcome. Come On In To Make A Deal! WAS Priced At $42,500 WITH THE EXTRA 10% DISCOUNT IT IS NOW ONLY $38,250!!! HURRY IN BEFORE THIS DEAL ENDS!! 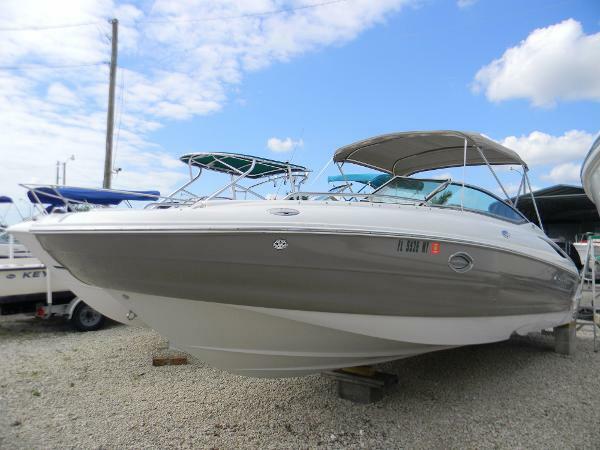 2004 Crownline 260EX Here is a deckboat with lots of room and features! It has an extended swim platform for good maneuverability in the back and a back seat that converts into a sun pad. 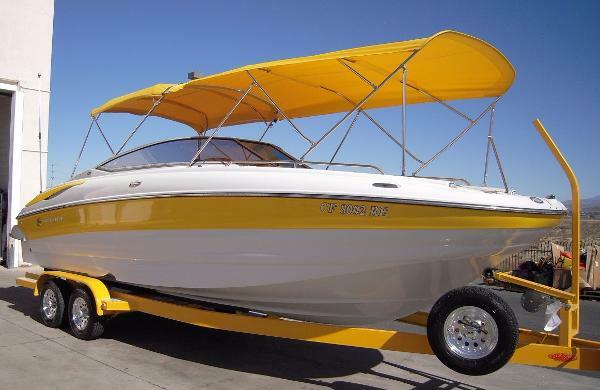 Other features include a bimini top, bow and cockpit cover, mooring cover, flip up bolster, cooler, snap-in carpet, depth finder, CD stereo, transom shower, docking lights, battery charger, tilt steering wheel, pressurized water system, and an anchor. It has a 280 hp fuel injected engine with a duo-prop drive for good handling and ability to plane. 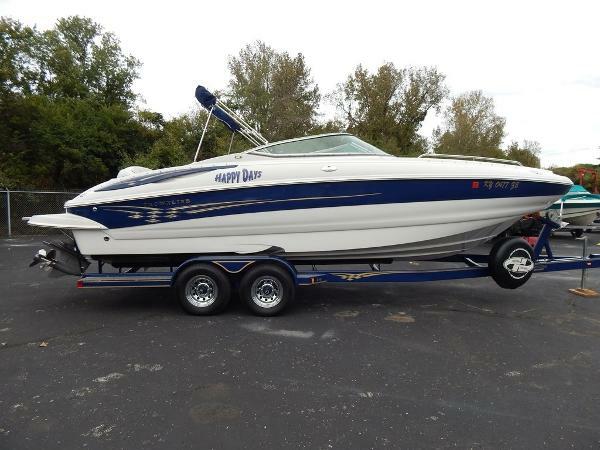 This boat has been cared for and is in great condition! Call or e-mail us for details! WE WILL CONSIDER ANYTHING IN TRADE!